طاهری, سیده محدثه, خلقی, مجید, ستوده نیا, عباس. (1394). پالایش آب‌های زیرزمینی آلوده به کادمیم با استفاده از نانوذرات آهن در مقیاس آزمایش‌های پیمانه‌ای و محیط متخلخل. مجله آب و فاضلاب, 27(1), 2-12. سیده محدثه طاهری; مجید خلقی; عباس ستوده نیا. "پالایش آب‌های زیرزمینی آلوده به کادمیم با استفاده از نانوذرات آهن در مقیاس آزمایش‌های پیمانه‌ای و محیط متخلخل". مجله آب و فاضلاب, 27, 1, 1394, 2-12. طاهری, سیده محدثه, خلقی, مجید, ستوده نیا, عباس. (1394). 'پالایش آب‌های زیرزمینی آلوده به کادمیم با استفاده از نانوذرات آهن در مقیاس آزمایش‌های پیمانه‌ای و محیط متخلخل', مجله آب و فاضلاب, 27(1), pp. 2-12. طاهری, سیده محدثه, خلقی, مجید, ستوده نیا, عباس. پالایش آب‌های زیرزمینی آلوده به کادمیم با استفاده از نانوذرات آهن در مقیاس آزمایش‌های پیمانه‌ای و محیط متخلخل. مجله آب و فاضلاب, 1394; 27(1): 2-12. از آنجا که بخش عمده‌ای از منابع غذایی از محصولات کشاورزی آبیاری شده با آب‌های زیرزمینی تأمین می‌شود، پالایش آب‌های زیرزمینی آلوده با استفاده از روش‌های داخل محل از قبیل استفاده از حائل‌های واکنش‌پذیر تراوا، ضروری به‌نظر می‌رسد. با توجه به ضرورت کاهش آلودگی اراضی آلوده به کادمیم در جنوب شهر تهران، در این پژوهش هدف تعیین جاذب کارآمد در نتیجه مقایسه میزان درصد جذب کادمیم توسط جاذب‌های نانوذرات آهن صفر ظرفیتی با کانی‌های زئولیت و کلسیت بود. نتایج حاصله حاکی از افزایش قابل توجه درصد جذب کادمیم توسط nZVI نسبت به کلسیم و زئولیت بود. روند افزایش غلظت جاذب نانوذرات آهن از 1 به 2 گرم در لیتر، بر محلول‌هایی با غلظت 2/0، 5/0 و ppm4 کادمیم بررسی شد و نتایج حاکی از افزایش به‌ترتیب 5/5، 4/3 و 5/11 درصدی میزان جذب کادمیم پس از گذشت 2 ساعت بود. همچنین در نتیجه افزایش غلظت اولیه آلایندگی از 2/0 به ppm5/0 ، به ازای تزریق 1 و 2 گرم در لیتر نانوذرات آهن پس از گذشت 24 ساعت به‌ترتیب، 45/5 و 75/7 درصد کاهش میزان جذب گزارش شد. 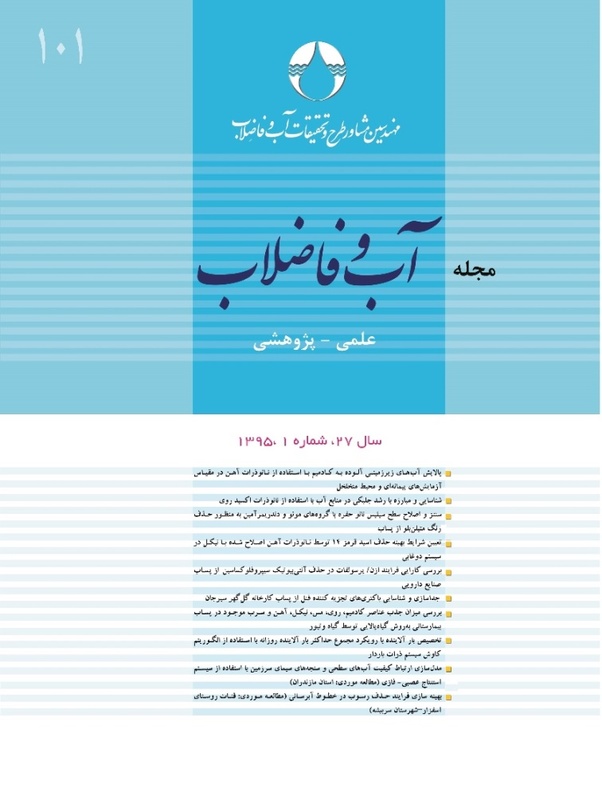 در ادامه اثر شرایط محیطی، تغییرات pH و دما بر میزان جذب بررسی شد. کاهش کادمیم نسبت به غلظت اولیه ppm4 طی 3 ساعت، در شرایط اسیدی (7/3=pH)، 15/37 درصد و در شرایط قلیایی (1/13=pH)، این نسبت به اندازه 75/92 درصد کاهش نشان داد. در نتیجه افزایش دما از 20 به 75 درجه سلسیوس پس از 6 ساعت، غلظت کادمیم 5/38 درصد کاهش داشت. به‌منظور بررسی اثرات محیط‌ زیستی تزریق نانوذرات در جهت جذب سطحی و ترسیب کادمیم، غلظت یون آهن موجود در محیط اندازه‌گیری شد. در واکنش محلول ppm5/0 کادمیم با محلول 2 گرم در لیتر جاذب، غلظت یون آهن پس از 24 ساعت نسبت به غلظت اولیه برابر 0041/0 درصد گزارش شد. در آزمایش‌های صورت گرفته در محیط متخلخل همگن اشباع قائم، تحت جریان آب آلوده با غلظت ppm92/2 ، تزریق جاذب نانوذرات آهن ظرفیت صفر با غلظت 3 گرم در لیتر منجر به کاهش آلایندگی تا زیر حد مجاز آب آشامیدنی شد. در واکنش نانوذرات آهن با کادمیم محلول در محیط، نانوذرات به‌عنوان جاذب کارآمد عمل نموده و ضمن جذب سطحی کادمیم در نتیجه گذشت زمان، کادمیم موجود در محیط را در نتیجه عمل ترسیب از محیط واکنش خارج ساخت. Since a major portion of the food we use is provided by corps irrigated with water that is supplied from groundwater resources, remediation of contaminated groundwater using in-situ methods like permeable reactive barriers (PRBs) seems to be a top priority. Given the need to reduce Cd contamination in southern Tehran, the present study was designed to compare the rate of Cd absorption by nZVI with that by Zeolite and Calcite. The results of the study revealed a higher Cd adsorption by nZVI as compared to that by Calcite and Zeolite. Also, when nZVI concentration was raised from 1 to 2 g/l, enhancements were observed after two hours in Cd adsorption by up to 5.5%, 3.4%, and 11.5% in solutions containing 0.2, 0.5, and 4 ppm of Cd, respectively.Moreover, for a contact time of 24 hours and when the initial concentration of the contaminant was raised from 0.2 to 0.5 ppm, the adsorption rate declined to 5.45% and 7.75% for nZVI injections of 1 and 2 g/l, respectively. In a second part of the study, such environmental conditions as changes in pH and temperature were investigated for their effects on Cd adsorption. Compared to the initial concentration of 4 ppm, Cd adsorption reduced by 37.15% under acidic conditions (pH=3.7) and by 92.75% under alkaline conditions (pH=13.1) after a contact time of 3 hours. Similarly, a reduction equal to 38.5% was observed in Cd adsorption after 6 hours when temperature was raised from 20 °C to 75 °C. In order to explore the bioenvironmental impacts of injecting nanoparticles aimed at adsorption and precipitation of Cd, the concentration of iron nanoparticles present in the environment was measured. As a result of the reaction between the solutions containing 0.5 ppm of Cd with the absorbent solution containing 2 g/l iron, the iron nanoparticle concentration in the solution was observed to decline to 0.0041% of its initial concentration after 24 hours. In the experiments conducted in a vertical saturated porous and homogeneous medium, injection of 3 g/l of nZVI, as the absorbent, into water containing 2.92 ppm of the contaminant reduced the contaminant concentration to levels below the limits recommended for drinking water. The reaction between nZVI and Cd dissolved in the medium revealed that the nanoparticles served as an efficient absorbent as they not only adsorbed Cd over time, but also removed it from the medium through precipitation. 1. Matlochova, A., Placha, D., and Rapantova, N. (2013). “The application of nanoscale materials in groundwater remediation.” J. Environ. Stud., 22 (5), 1401-1410. 2. WHO. (1972). Evaluation of certain food additives and the contaminants mercury, lead, and cadmium, Sixteenth Report of the Join FAO/WHO Expert Committee on Food Additives, WHO Technical Report Series No. 505, FAO Nutrition Meetings Report Series No. 51, Geneva, Switzerland. 3. WHO. (2008). Guidelines for drinking water quality: Recommendations, Vol. 1, 3rd Ed., World Health Organization, Geneva, Switzerland. 4. Boulding, J.R., and Ginn, J.S. (2004). Practical handbook of soil, vadose zone, and ground-water contamination: Assessment prevention, and remediation, Lewis Pub., Boca Raton, Fla., London. 5. Bigg, T., and Judd, S.J. (2000). “Zero valence iron water treatment.” Environ. Technol., 21 (6),661-670. 6. Hansel, C.M., Benner, S.G., and Neiss, J. (2003). “Secondary mineralization pathways induced by dissimilatory iron reduction of ferrihy drite under adverctive flow.” Geochim. Cosmochim. Acta, 67, 2977-2992. 7. Mueller, N. C., Braun, J., Bruns, J., Cernik, M., Rissing, P., Rickerby, D., and Nowack, B. (2012). “Application of nanoscale zero valence iron (NZVI) for groundwater remediation in Eroupe.” Environ. Sci. Pollut., 19 (2), 550-558. 9. Otto, M., Floyd, M., and Bajpai, S. (2008). “Nanotechnology for site remediation.” OECD Conf. on Potential Environmental Benefits of Nanotechnology, OECD Confrence Center, Paris, France. 10. Yang, G. C. C., and Chang, Y-I. (2011). “Integration of emulsified nanoiron injection with the electrokinetic process for remediation of trichloroethylene in saturated soil.” Sep. Purif. Technol., 79 (2), 278-284. 11. Dickinson, M., and Scott, T. B. (2010). “The application of zero valence iron nanoparticle for the remediation of a uranium contaminated waste effluent.” J. Hazard. Mater., 178 (1-3), 171-179. 13. Mace, C., Desrocher, S., gheorghiu, F., Kane, A., Pupeza, M., Cernik, M., Kvapil, P., Venkatakrishnan, R., and Zhang, W-X. (2006). “Nanotechnology and groundwater remediation: A step forward in technology understanding.” Remediation, 16 (2), 23-33. 14. Bezbaruah, A. N., Krajangpan, S., Chisholm, B. J., Khan, E., and Bermudez, J. J. E. (2009). “Entrapment of iron nanoparticles in calcium alginate beads for groundwater remediation applications.” J. Hazard. Mater., 166 (2-3), 1339-1343. 17. Wang, T., and Peverly, J.H. (1999). “Oxidation states on root surfaces of a wetland plant (Phragmites australis).” Soil Sci. Soc. Am. J., 63, 247-252. 19. Ara Mbula-Villazana, V., Solache-ri, O.S., and Olgui N. M.T. (2006). “Sorption of cadmium from aqueous solutions at different temperatures by mexican HEU-type zeolite rich tuff.” J. of Inclusion Phenomena and Macrocyclic Chemistry, 55 (3), 229-236. 20. Zhang, X.Q., and Li, W.X. (2007). “Sequestration of metal cations with zerovalent iron nanoparticles—a study with high resolution X-ray photoelectron spectroscopy (HR-XPS).” J. Phys. Chem. C, 111 , 6939-6946. 21. Kumarasinghe, K., Wijesekara, S., and Vithanage, M. (2014). “Starch stabilized zero valent iron nanoparticles on catechol remediation in aqueous media.” Proceedings of the Peradeniya Univ. International Research Sessions, Sri Lanka. 22. Wu, P.F., Kao, L., Yan, W., and Lien, H.L. (2014). “Nanoscale zero-valent iron for sulfide removal from digested piggery wastewater.” Journal of Nanomaterials, doi : 10.1155/2014/5184242. 24. Taghizadeh, M., Yousefi Kebria, D., Darvishi1, Gh., and Golbabaei Kootenaei, F. (2013). “The use of nano zero valent iron in remediation of contaminated soil and groundwater.” International Journal of Scientific Research in Environmental Sciences (IJSRES), 1(7), 152-157. 25. Khatoon, N., Husain Khan, A., and Pathak, V., Agnihotri, N., and Rehman, M. (2013). “Removal of hexavalent chromium from synthetic waste water using synthetic nano zero valent iron (nzvi) as adsorbent.” International Journal of Innovative Research in Science, Engineering and Technology, 2 (11), 2319-8753. 26. Prabu, D., and Parthiban, R. (2013). “Synthesis and characterization of nanoscale zero valent iron (NZVI) nanoparticles for environmental remediation.” Asian J. Pharm. Tech. 181-184. 27. Solache-ri os, M., and Olguin. M.T. (2005). “Sorption of cadmium from aqueous solutions at different temperatures by Mexican HEU-type zeolite Rich Tuff.” J. of Inclusion Phenomena and Macrocyclic Chemistry Sci., 55, 229-236. 28. Babel, S., and Kurniawna, T.A. (2003). “Low-cost adsorbents for heavy metals uptake from contaminated water: A review.” J. of Hazard, Mater., 97 (1-3), 219-243. 29. Schuth, F., and Schmidt, W. (2002). “Microporous and mesoporous materials.” Advanced Engineering Materials, 4 (5), 269-279.